Boom or bust? The exact track of Tuesday's powerful coastal storm will dictate who in New Jersey gets big snow and who does not. Holy guacamole, I took a lot of heat on social media on Saturday, for "hyping" the fact that New Jersey could see between 0 and 20 inches of snow. (Even I admitted such a forecast range was ridiculous, by the way.) But guess what? The most likely scenario for Tuesday's nor'easter looks like a "boom or bust" situation: one side of the state is likely to get buried, while the other side could see hardly any snow. Even though confidence is slowly improving, I have to stress again that this is a very complicated winter storm forecast, even moreso than usual. Ultimately, I could look at all the model data in the world, and still not have a complete grasp of how this storm may act and perform. There's really no such thing as a perfect snow forecast — you'd be wise to blur your eyes a bit when looking at any forecast map. My goal here — 48 hours away from "prime time" — is to give you a sense of the magnitude of impacts (snow, wind, coastal) for each region of the state. In Saturday morning's blog post, I laid out three track scenarios for our impending coastal storm: #1 Classic Nor'easter, #2 Coast Hugger, and #3 Out to Sea. I'm not going to rehash the description of each - you can check out the previous post for that. I'm now about 90% confident that we're going to fall somewhere between scenario #1 and #2. That means big snow is becoming more and more likely for at least part of New Jersey. The European model has (finally) come around to better agreement with the other models, depicting the heaviest snow (double-digit totals) to the north and west (NOT to the south and east). The Euro jives well with the Canadian model now too, with some difference in magnitude (the Canadian has much heavier snow). On the other hand, the NAM model is quite aggressive at lowering snow totals, especially along the coast. The NAM has the warmest 850mb temperature plot (that's about a mile up into the atmosphere), which would limit snow potential at the storm's onset. I do think the NAM's raw snowfall output is too low, but this solution will be one to keep in mind as storm time gets closer and this forecast continues to evolve. If you live south of the Raritan River, there is a distinct possibility that you will be very disappointed with snow totals from this storm. Meanwhile, the GFS has trended colder and so the modeled snow totals have increased. But I'm not a fan of the 00Z and 06Z GFS runs — they look a bit wacky. I'd love to see the GFS come more in line with one of the other solutions in future runs. --From Midnight Tuesday to Midnight Wednesday for eastern Bergen, eastern Essex, Hudson, and eastern Union counties. --From 8 p.m. Monday to 8 p.m. Tuesday for Atlantic, Burlington, Camden, Cumberland, Gloucester, Hunterdon, Mercer, Middlesex, Monmouth, Morris, Ocean, Salem, Somerset, Sussex, and Warren counties. --From Midnight Tuesday to Midnight Wednesday for western Bergen, western Essex, Passaic, and western Union counties. In other words, as of this writing, everywhere in New Jersey except Cape May County is under a watch. A Winter Storm Watch serves as a "heads up" that winter weather impacts (over a half-foot of snow) could significantly impact travel within 24 to 48 hours. A Blizzard Watch serves the same purpose, but with a higher risk of poor visibility due to falling and blowing snow. Watches are not a guarantee of bad weather, but rather a pretty good bet. The Watches will almost certainly be upgraded to more serious, more urgent Winter Storm Warnings or Blizzard Warnings sometime Sunday. --First Flakes: Will arrive in SW NJ between 8 p.m. Monday and 2 a.m. Tuesday. --The End: Most models taper off lingering snow by Tuesday evening, although the Euro model notably keeps light accumulating snow in the forecast all the way through Wednesday night. The map at the top of this post shows our first stab at a snowfall accumulation forecast for Monday night to Tuesday. Confidence that it's going to snow? High. Confidence that these exact contours and numbers will verify? Low to moderate. The highest snowfall totals in New Jersey — yes, over a foot — will occur in the northern and western portions of the state. This reflects the sweet spot — where the coldest temperatures meet the greatest forcing from the coastal storm. By the way, some models are pumping out over 2 feet of snow occurring somewhere in New Jersey. I can't go that high without additional evidence and consensus. Even though widespread 6+ inches of snow is nothing to scoff at, I do have some reservations about whether all of New Jersey will see the "big snow" that's being advertised. As I mentioned above, if you live in central, southern, or coastal New Jersey, there is a chance that you'll ultimately be disappointed. The lowest snowfall totals will almost certainly occur along NJ's southern coast. The temperature forecast both at the surface and through the atmosphere shows this storm may struggle to maintain below freezing temperatures. A period of rain — possibly lasting for most of the storm — would significantly inhibit snow accumulation. How far north and west will that inhibition effect stretch? Uncertain, but my educated guess is incorporated into the snowfall forecast. I'm also concerned about subsidence, or pockets of sinking air. All the air that ascends rapidly into the atmosphere to form heavy snow has to fall somewhere. And that "somewhere" will end up with significantly less snow. Impossible to pinpoint. But again we can try. Mesoscale snow banding is also impossible to pinpoint. Snowfall rates may reach 3 inches per hour during the peak of the storm. Yet again, we try to work this inevitability in our snow total forecast. And then there's the dreaded track wiggle. Even a difference of 30 miles east or west could dramatically shift snow totals. (Remember: at its widest point, New Jersey is only about 60 miles across.) As the forecast for the storm track continues to evolve, we'll follow the wiggles on our snow forecast. Oh yes, fierce winds are going to be a problem too — no surprise from such a deep area of low pressure. Expect sustained winds of 20 to 30 mph throughout the storm, with gusts up to 40 mph inland and 50 mph along the coast. Wind direction will be somewhat variable, but mostly out of the northeast ("nor'east"). The combination of snow and high wind is never a good one. Visibility will be poor for several hours, with near whiteout and/or blizzard conditions possible. Downed trees and power outages are possible (if not likely) too. Models have consistently suggested 2-3 feet of surge will occur during the storm, driven by those fierce northeast winds. I'd call this level of surge "typical" for a wintertime coastal storm. Factoring in the slightly elevated astronomical tide (due to Sunday's full moon), widespread minor to localized moderate coastal flooding is likely to occur at the times of high tide. As long as this forecast holds, the "usual" areas along coastal waterways will flood, and some road closures may become necessary. Tuesday morning's high tide will be the most precarious. We'll be closely watching Tuesday evening's high tide cycle as well. In addition, 10 to 12 foot ocean waves are expected to batter Jersey Shore beaches, causing moderate to major erosion. If you following my forecasts regularly, you know I strive to be anti-hype and anti-hysteria. I will not and can not negate or hide the significant concerns and reservations I've explained in this post. The risk for blizzard conditions and well over a foot of snow can not be ignored. 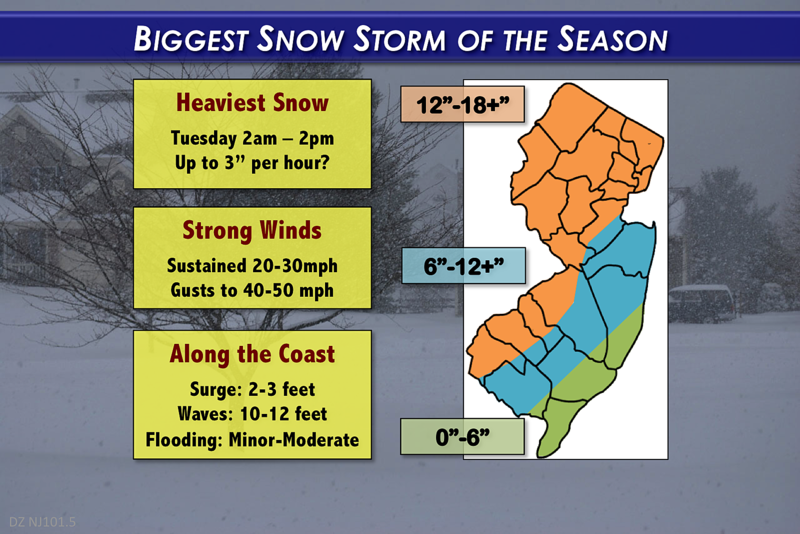 It's becoming crystal clear that this is going to be a significant winter storm for most of New Jersey. Maybe even top 10. Certainly one of the biggest, strongest we've ever seen so late in the season. So what do you do now? Possibly nothing. Worst-case scenario: You're stuck inside for 2-3 days, perhaps with no power for a time. I suspect school closures will be rampant on Tuesday, possibly lasting into Wednesday and beyond (depending on the severity of the storm in your town). Take time on Sunday or Monday to stock up on necessary supplies including the quintessential bread, milk, and alcohol. Batteries and junk food too. Gas up the car and snow blower, and keep the shovels handy. Charge your phone and other electronic devices. And that's about it — no panic necessary! Most importantly, remember that the vast majority of injuries and deaths in winter storms come from traffic accidents. There may come a time on Tuesday morning where travel is nearly impossible. Don't be stupid, and you'll be fine.